Political foundations play a key role in strengthening democracy in Germany. Through all its activities, the Heinrich Böll Foundation contributes to increasing civil participation in a country where involvement in public activities is very much a part of life for much of society. GEJ: Could you explain what the role of political foundations in Germany is and how they are trying to address the democratic problems or crisis that we are witnessing nowadays? Ralf Fücks: The basic task of the German political foundations is democracy promotion both domestically and internationally. So we are addressing democracy issues, citizens’ participation, equality, not only in Germany but also in other areas, especially Central Eastern Europe and also in the Global South. I should add that we are working independently from the Green Party. Not only on account of our legal framework but also because we are convinced that the efficiency of political foundations is very much linked to their autonomy – in other words that they are not perceived as a party branch. Concerning the political situation in Germany, perhaps similarly to the economic situation, Germany still seems to be an exception in terms of stability. The German party system is still working and up until now has managed to prevent the political extremes from gaining a strong parliamentary representation. More and more, political activity from the Grassroots, from civil society, is developing not within the party system but rather in opposition to the party system. There are no radical left or right-wing extreme parties in the Bundestag. The post-communists are swinging between systemic opposition and reformism. From time to time, in some of the state-parliaments (the German Länder) there are some small extremist right-wing groups but without any major political impact. So on the surface the party system seems quite stable. The participation in elections is still relatively high compared to other European countries, although it has been going down steadily over the last decades. But if you look closer, there are signals of a crisis of confidence in the party system. The gap between political institutions and society is widening. Parts of the German society, especially the more socially precarious groups, don’t participate in the political process any more. More and more, political activity from the Grassroots, from civil society, is developing not within the party system but rather in opposition to the party system. So we have more and more protest movements and citizens’ initiatives, which are no longer connected to specific political parties. Still the Greens are in a different position. 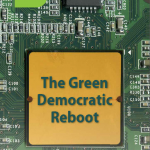 They are no longer working as the parliamentary wing of social movements but there is a lot of communication and open channels between the Greens and the environmental movement, citizens’ rights groups, and so on – in other words the traditional constituency of Green parties. Obviously there is a need to redefine the relationship between parliamentarian democracy and the party system on the one hand, and civil society on the other hand. I wouldn’t say the parliamentarian system is being brought into question fundamentally, but it is clear that it has to open up more channels, not only for communication with civil society but also for decision-making, beyond the traditional representative institutions. Issues such as local democracy, plebiscites, public participation play an increasing role in the German political fabric. Presumably the Böll Foundation is reflecting on this, does the foundation consider that it has a key role to play in this? Yes, because we see ourselves as a kind of relay system or a bridge between civil society and the party system, especially the Green party of course. One of our main activities is to bring together activists from the different spheres of political engagement – parties, parliaments, civil society – and to promote debates and political dialogue between them. At the same time we are doing some conceptual work, especially on new types of representation and participation, be it in urban planning, public services, or in the education system – to expand the field of civil participation in political decision-making. Can you explain how the Foundation works to achieve this concretely, on the national or federal or regional levels? For instance, we are running a two-year programme together with our state organisations (the Böll foundation itself is a federal organisation with 16 decentralisations branches) on the future of democracy. There are three main areas within this programme. First, the future of the party system, how the role of parties is changing vis-a-vis a more self-confident society and a lot of political initiatives now developing beyond the party system, as we mentioned. The second pillar is about how the public political sphere is changing, especially with the rise of the digital sphere, with internet and social media as new forms of communication and of political activism – how does that change the political process. The third pillar is about how to make democracy more inclusive and how to strengthen citizens’ participation in decision-making on the municipal and federal level. This is the debate on the relationship between representative and citizens democracy. We are providing workshops on these issues, conferences, publications – this is how we try to stimulate both the debate within the Greens and the public discourse on this issue. Of course people have particular interests, and the art of politics is to create the best combination of legitimate particular interests and the common good. Do you think that the Green foundations are still considered as an important partner from the perspective of these new social movements even if, as you mentioned, there is growing scepticism among these movements towards political parties? Up to now, we are seen as an open space for political thinking, debate and dialogue. Our relations with societal movements, think tanks and the cultural sphere are not less intense than with the Greens. In general the proximity between the Greens and these new social movements is more intense than it is with the other political parties. But of course there are also situations of tension especially when the Greens are in government. For example, there was the famous case of Stuttgart 21 – a big underground railway station project with huge costs and a very critical ratio of input and improvement compared to other preferences in the public transport sector. So there had been a huge mobilisation from civil society especially in Stuttgart, and the Greens initially supported that movement, taking part in public rallies giving them a parliamentary voice – in fact they were the only political party to do so. But then when it came to the sweeping victory of the Greens in the Baden-Württemberg elections, we had to negotiate a coalition with the social democrats, who were in favour of this project. So the compromise was to have a referendum at the state level on the project, at which there was a narrow but definite majority in favour of it. So now the Greens in the government are obliged to run the project and the only way to keep a certain critical distance from it is to put a cap on public subsidies to it, and to carry out serious environmental monitoring and regulation. So it’s not always easy to keep that alliance if you are in government! Absolutely, and that’s a very serious issue in Germany too now, as we come to the necessity to build new power grids – to connect the wind region in the north of Germany with the industrial core regions in the west and south – you have a lot of local resistance to that. And here it becomes very evident that without a proper process of information and early participation of citizens, you get stuck into this kind of contradiction. So the whole issue of citizen participation has become a precondition for effective government. But are we Greens sometimes too optimistic about this? Ingolfur Blühdorn writes that participation is not necessarily compatible with “ecologisation” – paraphrasing the Winston Churchill quote and saying that ecological democracy is “the worst system apart from all the others” – so don’t we have to take into account the contradictions of the current state of individualism? Of course people have particular interests, and the art of politics is to create the best combination of legitimate particular interests and the common good. Politics is about a concept of the common good which gives you both the moral authority and the political legitimacy to take decisions which may be opposed by specific interest groups. So this tension between particular interests and the public interest is an ongoing challenge. Coming back to this tension between the foundations, the movements and the parties: you say you are independent from the party, yet the foundation, in Germany as in other countries, is working on Green goals, which are nearly always the same as the party’s goals. Of course, our programmatic goals and political attitudes are not different, we openly refer to the Green political project and we are part of the Green political family – but an autonomous member of it. If you want to have a serious dialogue between the Greens and some critical social movements, on the one hand, or the industry, on the other side of the spectrum, it is good to be seen as an independent facilitator and not just a party agency. So maybe it is one of the specific achievements of the Böll Foundation that we are seen as a place for open and controversial debates between different actors. This definitively gives us a bigger outreach than if we only operated in the shadow of Green politics. We see ourselves as a kind of relay system or a bridge between civil society and the party system. It is clear that all European democracies are not on the same level when it comes to citizen participation. It seems German democracy is particularly lively, and this is the result of history as well as the economic situation, but it’s also the result of efforts in the areas of culture and education, do you share this view? There is quite an extended network of democracy education in Germany, starting with the school system, as in other countries, but then you have a lot of agents of public political education and discourse, it’s a very dense network of partly state-funded, partly private institutions. And since the late 1960s you have a very deep-rooted tradition of citizens’ initiative. There have been ups and downs but in general you have a very high level of involvement; one in three adults in Germany is at least temporarily involved in public activities, across a large spectrum from explicitly political NGOs to local initiatives and social services. Beyond the traditional sorts of local associations there is a new kind of civic political engagement: environmental movements, feminist groups, civil rights activists and so on. In addition to that, you have a very diverse and pluralistic media landscape with lots of public debates. This is the positive story. But looking at developments in other European countries, I’m not sure what would happen if the basic arrangement of German democracy – the combination of economic growth, social progress and democracy – is seriously put into question. If social inequality, insecurity and fragmentation will become dominant, I’m not sure how stable the German democracy would remain. The director of the Austrian Green Foundation Andreas Novy underscores the importance of social innovation, and believes the foundation there should play a key role in supporting this innovation. Do you think the same? The Böll foundation is in the very centre of these debates – sustainable lifestyles, another kind of mobility, open source, sustainable agriculture and consumption – our “Meat Atlas”, for example, gained enormous public resonance in Germany as well as abroad. At the same time we are very keen to be in a dialogue with the industry pushing for green innovation in the car industry or in the energy sector. And of course we’re working on a new regulatory framework for social and environmental innovation. Policy matters, so do institutions. We can’t reduce ourselves to social movements if we want to be a driving force for the Great Transformation. The Green European Journal asked experts, activists, and politicians from around Europe about the politics of basic income where they are.